Ever wonder how you can reuse and recycle old clothes? Well, today I thought I’d share some awesome ideas you can use for clothing you either get from thrift and second hand shops, or you can go through your closet and find stuff that doesn’t fit anymore or is a little worse for the wear. Buttons make for awesome DIY and arts and crafts projects. There’s a bazillion things you can do with buttons! So cut them off, and save them – keep them in a tin or a jar and you’ll soon have plenty of buttons for all your projects! Old t-shirts are great for dusting. Old terry cloth bathrobe could be made into washcloths. Just pull a thread and you’ll have some lovely yarn for knitting and crochet projects! Rag rugs are easy to make and you don’t need to even know how to sew for some of the various different project tutorials floating around and about! If you don’t know how to sew or make a quilt, no worries, there are actually companies out there that will make quilts out of old t-shirts, sweat-shirts, etc. for you! How cool is that!?! Have a shirt with a hole in it? Salvage the remainder of the fabric to use for simple doll clothes for your fashion dolls! You could tie scraps of fabric together to make some very funky shabby curtains! I love making journals and books out of recycled materials…especially with fabric covers! You can do amazing things with blue jeans. Spray on some bleach and rip holes into them for grungy jeans, or get crafty with fabric markers and paint or even sew on beads and buttons. If the jeans don’t fit anymore, you can use denim as an art canvas even! 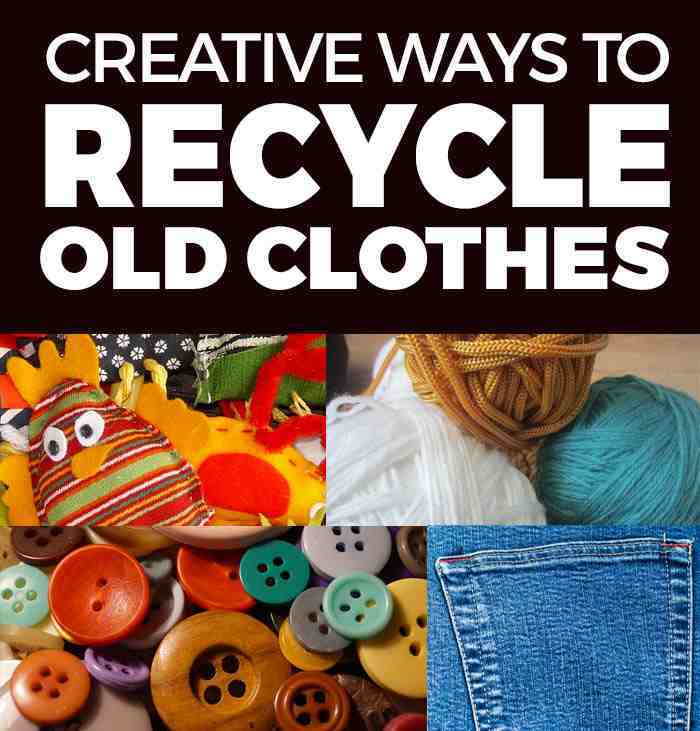 I hope you enjoy this list of 12 ways and ideas to recycle old clothes! Have any ideas we might not have listed here? We’d love to hear from you in the comments below!